INTRODUCTION: Throughout the mid 1990’s and early 2000’s numerous university programs compared perioperative complications in laparoscopic donor to the gold standard open technique in order to validate the emerging standard of care for nephrectomies. As innovation becomes the norm, an important question yet to be answered in the literature is how the complication rate at a community hospital performing donor nephrectomies compares to the larger academic centers now that laparoscopic nephrectomies are universally performed. METHODS: All the charts from patients undergoing laparoscopic nephrectomies between January 1, 2006 and December 31, 2008 were reviewed. The examined outcomes were operative time, estimated blood loss, intra-and post operative complications, and length of hospital stay. The results were stratified in order to compare them with national figures using statistical analysis. RESULTS: A total of 120 laparoscopic donor nephrectomies were performed from 2006-2008. Mean donor age was 40.66 years and 60.8% of the patients were female. Left kidneys were procured 88.3% of the time. Operative time averaged 110.0 minutes. Intraoperative complications were 10% and post-operative complications 5.83%. Length of stay was 2.41 days. Estimated blood loss was 114.6 ml. In comparison to data published by Johns Hopkins, Cleveland Clinic and a meta-analysis from the United Kingdom, our community hospital had significantly shorter operative time, less estimated blood loss, lower intra and post-operative complications, and a shorter overall stay. 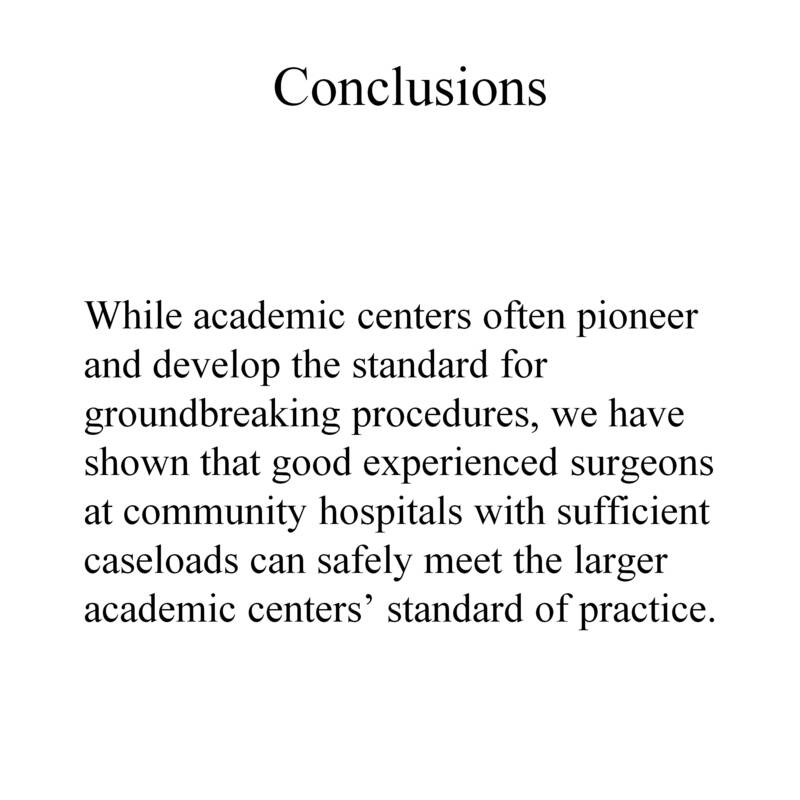 CONCLUSION: While academic centers often pioneer and develop the standard for groundbreaking procedures, we have shown that good experienced surgeons at community hospitals with sufficient caseloads can safely meet the larger academic centers’ standard of practice.